Real life stories find a better connect in these virtually connected times we live in. Gone are the days when a Bollywood star or a cricketer became the face of a brand; new age companies are more in sync with new age consumers and so we find a rise in the celebration of everyday heroes and their inspiring stories. Moreover, brands are trying to crack the millennial generation who prefer brands that are open and transparent, brands that celebrate the true spirit of their being, brands that believe in bringing alive their philosophy. 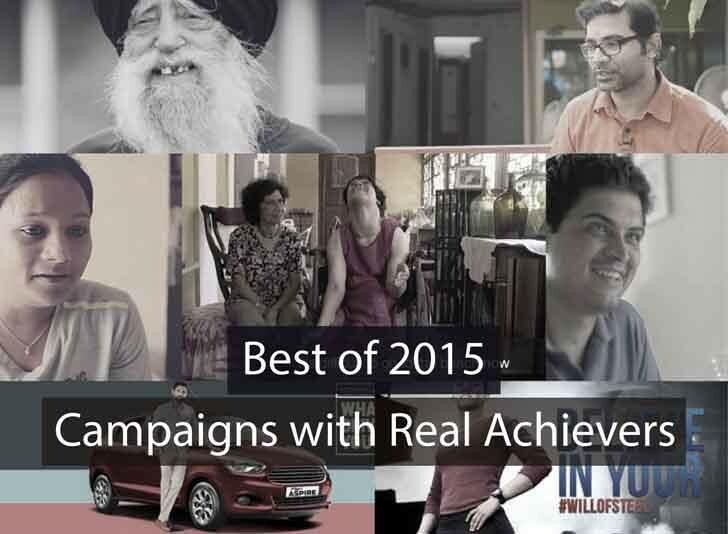 This year saw many Indian brands roping in real life achievers to bring alive their brand message or lend an air of authenticity to their communication campaigns. More Indian brands are choosing to build their brand image one real story at a time. Popularly known as the ‘Turbaned Tornado’, India born British Sikh Fauja Singh is not your average marathon runner. He is 104 years old and started his marathon running career at the ripe old age of 89. His personal best time for the London Marathon 2003 is 6 hours 2 minutes, and his marathon record, for age 90-plus, is 5 hours 40 minutes at the age of 92, at the 2003 Toronto Waterfront Marathon. Although he retired at the age of 102, life after retirement is a lot of discipline, right food and running. FMCG major, Nestle India that also completed 100 years in the country found a perfect contemporary in Fauja Singh. Partnering with Delhi Half Marathon 2015, it brought on board Fauja Singh as the ambassador of its ‘‘100 and running’ campaign. An inspiring digital film was rolled out as a salute to Singh. Read all about Nestle India #!00AndRunning campaign. And to discover what young India aspires for, Ford roped in the very versatile Farhan Akhtar as an anchor to bring forth passionate stories of real life achievers that included Phanindra Sama, Co-founder & CEO, RedBus.in, Rajat Tuli and Rahul Anand, Co-founders, Happilyunmarried.com, Indrani Medhi, Researcher, Microsoft Research India and Lakshmi Pratury, Curator, INK. Each of them shared their story in a drive-by interview with Farhan. Read all about Ford Figo Aspire #WhatDriesYou campaign. Last year, technology giant, Hewlett Packard had embarked on a global makeover mission to connect with millennials through its campaign ‘Bend the rules’. Along with showcasing its Pavilion x360 that bends too, it also showcased stories of real life young achievers who were ‘bending the rules’ of success: Vijay Singh of Rajputana Customs; Varun Agarwal, founder of Alma Mater; Comedian Abhish Mathew; Malavath Poorna, the youngest girl to climb Mount Everest; Deepak Ravindran, founder of Innoz; Ishita Malaviya, founder Shaka Surf club, YouTube star Shraddha Sharma and more. This year, it also introduced a slight desi twist to its communication via ‘I like your soch but love my approach”. The video stories included young achievers who had ‘bent the rules’ with their ‘alag soch’, like Nitin Saluja and Raghav Verma of Chaayos, Suresh Menon and Hozay and others. Read all about HP India #BendTheRules campaign. JSW Steel, one of India’s leading private sector steel producer from the JSW Group wanted to celebrate the steely determination of young men and women in the country. The company launched ‘Will of Steel’ – a campaign that would help recognize, appreciate and give support to aspiring people. As the face of the campaign, it roped in Geeta Phogat, the first Indian woman to win a Gold for wrestling at the Commonwealth Games in 2010. Growing up to be a wrestler was never easy for this woman belonging to a small village in Haryana called Balali, the hotbed of patriarchy and regression. Having a wrestler father who always encouraged his daughters into wrestling further intensified the societal hurdles for this family. Defying all forms of resistance from their community, Geeta wrestled under the constant encouragement and guidance of her father truly reflecting a ‘will of steel’. Read all about JSW Steel #WillOfSteel campaign. Lenovo wanted to illustrate how its YOGA products embraced unexpected or weird design and functionality, so that its owner could do amazing things with it. It launched #GoodWeird, a global marketing campaign that had an India leg featuring creative folks who did amazing things with their Yoga products. It created a series of films that chose creative storytelling rather than the usual documentary approach, featuring Eina Ahluwalia, India’s first conceptual jewellery artist; Chef Saransh Goila who creates his own fusion dishes; fashion designer Nikhil Thampi. Each of their stories tells you how their creativity and the flexibility of Yoga tab can create something GoodWeird. Read all about the Lenovo #GoodWeird campaign. The brand roped in Padmashri Arunima Sinha, the first woman amputee to climb Mount Everest, all with the help of a prosthetic limb and a rod in the other leg. Padmashri Shital Mahajan, the skydiver with over eight world records including youngest woman to jump over North and South poles, and many others comprise the video driven campaign. Read all about Mountain Dew #NaamBanteHainRiskSe campaign. Vistaprint, an online print store that offers business cards, printed or embroidered apparel and other business marketing needs like brochures, flyers, etc, had launched the #ChaltaHaiKoChaltaKaro campaign with a series of ad films throwing light on offline printers’ woes. To bring alive the message, it chose real life heroes – young entrepreneurs who chose not to fall victim to the ‘Chalta Hai’ attitude. A series of films celebrating this very spirit featured Arunabh Kumar, Founder of new age media company, The Viral Fever; Ankita Tandon, Founder of Coupon Dunia, Anuj Goyal of Brijwasi Sweets who share their story of success and how they broke the ‘chalta hai’ norm. Read all about Vistaprint #ChaltaHaiKoChaltaKaro campaign. The importance of life insurance was told to a viewer through the stories of these people who experienced a second chance at life. This is the real story of Shalabh Goglani, an IT professional who took his life for granted until a near fatal accident makes him realize how precious he was for his family. The story includes inputs from his wife and parents too. Read all about Max Life Second Chance campaign. The brand launched the ‘Red Ramp Project’ wherein a ramp was built on Kiri beach in Goa. Disabled people could now visit the beach via the tiled ramp and feel the waters lapping at their feet. A campaign video was created with three protagonists who had varying physical challenges. The film showed how this ramp helped them fulfil a long awaited dream – to visit the beach. This is the story of Fredrika Menezes, who has cerebral palsy, is a writer, a poet, and an author by profession; Salil Chaturvedi, a paraplegic, is a writer by profession who has represented India in Wheelchair Tennis and is the only disabled person to have sailed Mumbai to Goa; Anuraag Khandelwal, who has polio, is the ECD at creative agency Soho Square, whose work has won many national and international awards. Read all about the Red Ramp Project. The world is hungry for everyday heroes and their inspiring stories. A study on content shared on social networks finds that the most shared content is those of inspiring real life achievers; millennials love to share those stories with their connections. It is good to see brands recognizing that and leveraging that to serve their communication needs better. It is easier for today’s generation to connect with and be inspired by one of their own, while making a connect with the brand message too.